Ed. 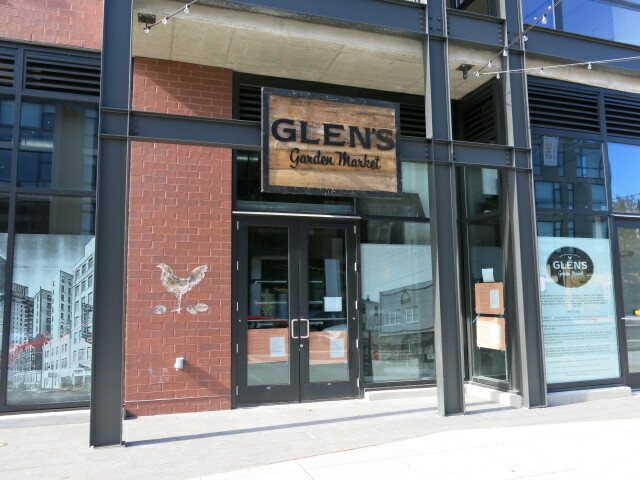 Note: Glen’s Garden Market’s last day in Shaw is Monday with a farewell party (and $2 drafts) starting at 5pm. “I’m writing to clear up some prevalent misconceptions about our difficult decision to close Glen’s Shaw. We’re not blaming the community – our Neighbors have been our tireless champions, remaining patient when we stumbled, treating Glen’s like a second home and coming together here to talk, drink, shop and hang out. We’re also not blaming our landlords – our rent structure was favorable, and JBG has been a terrific and compassionate partner to us since day one. It may not be obvious, but grocery is a brutally thin-margin business. If everything goes right (a near impossibility), we stand to make one third of a penny for every dollar we do in sales. In our case, we play the already difficult game of keeping an independent grocery store in business on the level “Extra Hard”. We pay our folks a living wage. We provide generous benefits, which include health care, profit share and a full and nourishing meal every single day. We pay our vendors fair prices for their small-batch products. We pay more for our energy because it is critically important to us to be 100 percent renewably powered. We even pay more for things like waste haul-away because we choose to compost, and invite the community to compost with us. The simple fact is, no matter how hard we tried – and to clear that up as well, we’re not closing because we didn’t try hard enough – we just couldn’t get enough people through our doors on a daily basis to make the math work. We know the store felt busy on the weekends – we were there working our tails off every single Saturday and Sunday – but our weekday foot traffic just did not compare. As is the case with any food operation, the place needs to be busy ALL the time to survive, and ours just wasn’t. So, we were forced to pivot – not because we wanted to close, or didn’t try to succeed, but because we’d reached the point at which Glen’s Shaw just couldn’t survive. We deeply appreciate the outpouring of support since we made our announcement last week, and we’ve been grieving the loss of Glen’s Shaw right there with you. This whole process is truly heartbreaking. All of that said, we are truly excited about the future of Glen’s, and we are eager to turn the full force of our combined might, attention and mission-dedication to ensuring our flagship location thrives for generations to come.